My mother raised me by the age old adage of, “If you’re early, your on time. If you’re on time, you’re late. Late is unacceptable.” This upbringing has stuck with me to this day to the extent that being late is something that makes me uncomfortable to the point where my insides shudder. A seemingly simple question, yet something I had never been asked before. My mind raced to determine what to include and what was merely auxiliary. In the moment, the most logical place to start was by telling when and why I began running. Growing up, I played ice hockey, which I played from the age of five until graduating from college. After college, I wanted a form of exercise that was accessible and affordable, and running seemed like a logical option. I began running three miles a few times a week and eventually on the weekends would venture out for five- to six-mile runs. It all seemed so simple, so benign. Persistence paved the way for curiosity and I trained for a road marathon. That went seemingly well and I heard about a race called the Vermont 50 Mile. I had no idea what an ultra was, but felt the allure of the unknown. It was during this race that I fell in love with ultrarunning. It became my new passion, filling a void that was left by no longer playing ice hockey. Me being me meant that I was now an ultrarunner. All or nothing, black or white, in or out–and I was in! I found early success in the sport, winning races while seeing constant improvement, but like any good storyline there was a turning point. Ultimately I would call it fate. In 2005, I toed the line at the Stone Cat 50 Mile in Massachusetts. From the start I felt off, not being able to eat or drink and feeling the need to duck into the woods every few miles. My body wasn’t happy, something was wrong, but I continued as my time was not indicating my struggles. Then around mile 45 I experienced pain in my right thigh. I chalked it up to not eating or drinking, and told myself this must be what total depletion feels like. I walked for a few minutes waiting for the pain to resolve, but ultimately convinced myself to run. I ran but somewhere around mile 48 I tripped, fell, and blacked out. In the fall, I ended up breaking my femur. Not only did I break my femur but I broke it so badly I was told I may never run again, let alone walk without forethought. I had surgery, spent several days in the hospital, and then three months in bed flat on my back. During this time I had nothing to do, but think. I promised myself several things during this time. My first promise was to my husband and myself. I promised that, moving forward, I would be sure to give my body the nutrients it needed in everyday life and as an endurance athlete. I would be more attentive to listening to my body. My next promise was to myself, I would run again. I would listen to my doctors, I would do the work and I would commit to getting back to my passion at whatever capacity that might be. My final promise was also to myself, I would do my best to not take things for granted in life. I would allow for gratitude instead of criticism. It took several years, but I began running again. It felt awkward, it felt physically and emotionally painful, but I learned to work on each component. I learned to accept the help of others, I learned to be better in expressing my feelings, and I learned that patience is not my strong suit! Sometimes during my recovery, I progressed, sometimes I plateaued, and sometimes I regressed. During the triumphs and during the tears, I held true to all of my promises. Aliza has asked, and now we invite you to answer by leaving a comment. What’s your running story? I was a lifelong cyclist. I hated running. It hurt my feet, I got shin splints and pain all through my legs. It was slow and arduous, not at all like gliding along at 30mph. When my wife said she wanted to start running to get in shape, I agreed to support her journey. Privately I was dreading it. The first step was going to a real running store to get her fitted. 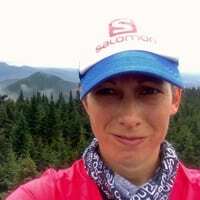 As she was trying on shoes I browsed my way to the trail running shoes, a section of muted colors, distinctly different from the bright neons and fluorescents that filled most of the store. We live right next to a trail network and I’d occasionally take my dog hiking. If I was going to do this I figured I might as well run someplace pleasant, not on a road. I asked to try some on, and though I new my size, the salesperson was adamant about measuring my feet. “You’re right on the borderline. Do you prefer a 9 1/2 or 10?” she asked. Um, I’ve been an 8 my whole life. You’re a 9 1/2, minimum. Um, no. 8. Sometimes an 8 1/2. Why do you think you’re an 8? she challenged. I’ve always been an 8, since I was 16 or so. When you run, do you get blisters on the ends of your toes? Do you get shin splints? Because I’m not a runner. I’ve never really enjoyed it. No. Because your feet are a size 9 1/2 and you’ve been cramming them into an 8 your whole life because some kid at Payless measured your feet wrong when you were young. I ended up with a pair of blue and orange Saucony, size 9 1/2. I downloaded Couch to 5k to my phone and the next afternoon went for my first run. It sucked. It didn’t hurt. I just couldn’t do the program because running for 30 seconds seemed like an eternity of suffocating torment. I thought I was in shape because I was riding regularly. It made me angry that I was so winded. So I ran/walked the next day, and the day after that, determined to run a mile. I mean, it’s just a stupid mile, right? I slowly began to whip my body into shape and along the way discovered that there are actually trail races. I found a 5k that raced up an extinct volcano. It sounded cool, but I saw they had a 12k option. The 5k ran up, partway around the rim, then through the caldera and back down. But the 12k ran the entire rim and went through the caldera twice, plus did a little jaunt down the backside of the cone. That sounded like more fun, and hey, it’s just 12k. I signed up. My first race came after just six weeks of running. It’s good that I didn’t understand the elevation profiles. It turns out that volcanoes, or this one in particular, are quite steep, Steep enough that the trail has handrails and chains to assist you in the ascent. A fair amount of the race was out and back, and the people that were way ahead of me would pass with words of encouragement and high-fives. The volunteers were dressed up and the start/finish area and aid station were like little celebrations. After years of racing bikes at an elite level, where many take an unfriendly if not outright hostile approach to other competitors, it was refreshing to experience such an entirely enjoyable and friendly event. Not to mention that I sucked at this running thing and despite wanting to go fast I realized that I wasn’t going to be in contention. I was suddenly relieved of any need to produce a result based on past events or compare myself against athletes I had histories with. I was having fun and actually enjoying my surroundings. Turns out when you’re going fast on a bike you miss a lot, but running… you see everything! The final kilometer was a staggeringly steep downhill, first over slickrock, then an exhilarating plummet down a gravel access road. I yo-yo’d with two other runners as we plunged to the finish, barely nipping them at the line, then sharing congratulatory hugs and handshakes and thanking one another for the unspoken push to reach a new threshold. I am astonished that I didn’t stumble and faceplant in the final meters. I could barely walk the next day. Or the day after, when I signed up for a 25k and committed to running a marathon. I also changed my default sport in Strava from cycling to running, something I never thought I’d do. When I began my running journey a little more than 18 months ago I “ran” my first mile in just under 14 minutes; now I’m under 9. I completed that marathon, injured my achilles, rehabilitated and come back stronger and smarter and completed my first 50-miler, with plans to work my way up to 100 and qualify for Hardrock. In my mid 30’s I got involved with triathlon. Found I wasn’t much of a swimmer but could run fairly well. In due time I gravitated to running events. Longer events interested me due to the ‘crazy’ factor. I don’t think I’m particularly good at the truly long events but I keep doing them due to my stubborn nature. I ran the half at the Trapp Mountain Marathon this weekend. Full marathoners start an hour earlier and run 2 loops of the same course. On her way to winning the marathon, Aliza lapped me in the last two miles. I was struggling at that point, and she came flying out of nowhere and passed me like I was standing still. I felt like I had just been passed by a deer or a gazelle – just a startling flash of grace and speed. I’ve never seen anyone run that smoothly. It was amazing! At the start of 2014 I began running after a routine checkup revealed my blood pressure was around 140/80 at the age of 32. I was also 224 lbs. Clearly, I needed to make some changes. I kept running and made 3 miles fairly consistent, and eventually signed up for and complete my first 5k. I eventually went to the running store’s Wednesday night beer run. Surely on a Wednesday night 3-4 miles was a reasonable distance before beer. Nope. They typically ran 6 miles again. This time instead of begging discouraged, I just ran shorter than everyone. Over beers I got to know folks a little better, and started making Wednesday night beer runs a fairly regular occurance, and kept working on 6 miles. A group from the running store were all going to run a 5k, so I joined in on the fun. It turned out to be a trail 5k. I had a blast in the dirt and mud, and then was invited to go trail running the next day. I ran 8-9 miles that day. Something about the trails just kept me wanting more. They told me that they were going to make Sunday trail runs a regular thing because they were training for the Pikes Peak Marathon, and I could go with them whenever I liked. The next Sunday we went to a state park in Missouri and I ran 14 miles. I was hooked. I trained with them all summer, ran my first half marathon in September and my first marathon in December. By this time I was down to 165lbs! I had never felt better in my entire life! One of the trail we ran was called the Green Rock Trial. It was 14.5 miles one way. I made the comment some time in July that we should make it a goal to run the entire thing out and back by the end of 2014. Three weeks after my first marathon a group of 4 of us set out to run the trail out and back for the 29 miles. In the process, we took a wrong turn somewhere and got some bonus miles to make the 29 miler a 32 miler. It took us 8.5 hours to finally finish but we had done it! 2014 was my couch to 50k year when I didn’t even know trail or ultra running even existed at the start of it all! I grew up not knowing that not everyone spent their childhood on mountains, eating lunch on cliffs. I spent all my days having fun while running, trying to catch my father who got away. As high school came, I allowed winning to take over my happiness, if I wasn’t winning…I wasn’t happy. The early success I found went straight to my head. For 8 or so years, this obsession with winning overtook my life and eventually made me try to walk away from running altogether. Long gone were the days of running for the fun of it, I had dug myself into a very deep hole. As I am now realizing that running will always be my life, I feel like I can finally let go of this winning obsession and start having fun again. Running has been my best friend and worst enemy, but has never left me.